Thanks to the C-dramas love for giving audiences so many promotional spoilers, the online portal QQ has just released 16-minute cuts of each of the first three episodes of Bu Bu Jing Qing. I confess to quite enjoying the extensive sneak peek and now I’m genuinely excited to catch the drama when it airs on April 22nd. Either Bu Bu Jing Qing is going to work or its going to crash and burn big time. There is no in between because there isn’t an audience for this story if it’s just a run-of-the-mill corporate inheritance and love quadrangle modern drama. Those are a dime a dozen in C-drama land, and frankly BBJQ also tosses in convoluted time travel and past lives hoodoo and I can’t imagine a new viewer who has never watched the period drama Bu Bu Jing Xin picking the sequel up for the heck of it. The bar was set so high with the love story between 4th Prince and Ruo Xi being so epic and devastating, it’ll be like killing my OTP twice if the sequel doesn’t deliver on their second chance at love with a higher possibility of a happy ending. Who isn’t scarred for life the way it ended in BBJX? A tearful death would have been easy, instead we have Ruo Xi dying without never seeing her 4th Prince (and wearing his favorite outfit while waiting for him), while 4th Prince doesn’t even know she died until a freaking good week later when he receives the official notification that 14th Prince’s consort Maertai Ruo Xi has passed away. Then he finds her remains have been cremated already! I’m still shocked he didn’t fillet 14th Prince right there and there, thank god 13th Prince was around to calm his 4th brother down. Anyhoo, it wasn’t just Ruo Xi and 4th Prince that had it bad in the drama, let’s never forget 13th Prince and Lu Wu and their 10 years of incarceration followed by her jumping in a river, poor steamed to death Yu Tan and her forever love and devotion to 9th Prince, and 8th Prince with his unrequited love for Ruo Xi’s sister Ruo Lan and the way his amazing wife Ming Hui loved and died for him. I’ve linked to the extended previews of the first three episodes below as well as leads Liu Shi Shi and Nicky Wu at all the media events promoting this drama this week being super adorable and lovey dovey. I don’t need the sequel to deliver the same level as angst since the stakes in modern times are different (no creative capital punishment yay! ), but I do need the sequel to make sense. I have to believe that modern day Zhang Xiao and 4th Prince have a fanciful but believable reason to be fated for each other through time and lives. 4th Prince has his ring and Ruo Xi’s hair pin buried together along with other treasures where she was born. He says “since you can’t come here to be with me, I’ll go there to be with you.” On the way North, the convoy encounters a freak sand storm so the box of treasures is lost in the desert buried under the sand. Emperor Yongzheng dies. Back in the present, Zhang Xiao meets Yin Zheng at the museum in front of the Emperor Kangxi and Princes painting. He doesn’t remember her but she remembers him as 4th Prince. She chases after him. Zhang Xiao meets present day 10th Prince and Emperor Kangxi and lands a job at Zhen Tian Corporation where everyone works. She even recites the same poem to modern day Kangxi who is the President of Zhen Tian Corporation. When she asks modern Kangxi if he likes to drink tea I totally teared up. When she is there, she runs into her doppleganger, a top model named Lan Lan who is dressed the way Ruo Xi is dressed in the Qing dynasty. Zhang Xiao tries to figure out if there are multiple time lines out there and what is really going. Before she can investigate further, she is injured in a fall and loses her memory the same way as when young Ruo Xi fell down the stairs and post-accident Zhang Xiao woke up in her body. Yin Zheng visits Zhang Xiao in the hospital and covers her with the blanket and she grabs his hand the way Ruo Xi did when 4th Prince visited her that time when she was sick. Lan Lan appears to have ulterior motives to hang around Yin Zheng. Oooo I am so excited!! I am curious, do you think viki will have it? I will need english subs. They have a channel page already set up for it, so I am assuming they will. I remember being so lost when they speak in poems. So glad the subbers over at Viki translated it in S1. I absolutely ADORE her blossom dress, so gorgeous. I am not feeling it. unless Koala say watch I am not going near it. Dare I hope Ms Koala that you’ll recap the first episode? I feel you babe I feel you, I’m still miffed at the death of kathrine she was the best thing that has and will ever happen to The Vampire Diaries. That aside I’m so exicted for this drama. I can’t wait fo it to start. all of the old ruo xi and si ye scenes paralleled with the current day zhang xiao and yin zheng made me cry so much. The flashback scenes are bringing tears to my eyes. I haven’t watched BBJX in over a year, but the 1st preview of BBJQ brought everything back!! Now I’ve got to watch all my favorite scenes to be emotionally ready for April 22. I’m hoping for another epic, gripping, beautiful story…but lets be honest – I don’t care what happens as long as Ruo Xi gets her 4th Prince **with both their memories intact! 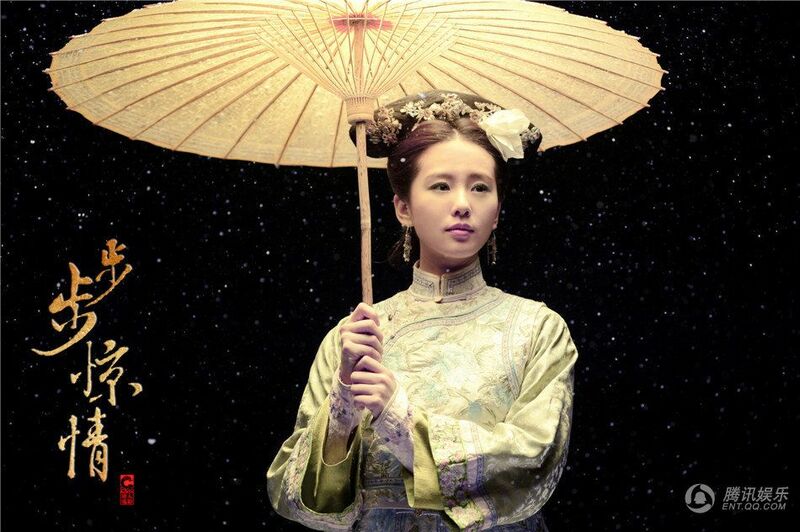 That modern day Ruo Xi (not LSS’s Zhang Xiao) really looks like her! someone correct me if i’m wrong, but i think both are played by liu shi shi. I like ShiShi’s dress w peach blossom! So pretty. : ) n who is the hussy who dare pretend to be Ruoxi? I dislike her already. There must be some kind of story behind Lan’s tattoo. … The first episode left me confused. Leaving aside my fondness for Si Ye, his doppelganger left Zhang Xiao/Ruo Xi bawling her eyes out without offering a tissue and left early due to his busy schedule (I presume that’s the reason why he looked at his watch), and then he turned around and helped her pay back the money for the balloons? Isn’t that rather inconsistent? But I’m looking forward to the rest of the ep, one more day down! start to dislike shishi after her dating with a man twice her age. Ms. Ockoala: wonder if you have had a chance to watch the first couple episodes. May be we should never have wished for a sequel. Have you seen the first episode yet??? I am too anxious to find out… or read your summary and reaction to it…. poor me I really need eng sub… and thanks to those who can help translate!! That aside… I am rewatching BBJX again… love love Ruoxi and 4th!! Hey Koala-unni! I just watched the first 4 episodes in uncut version. Do you know what’s going on with all these versions? I think there’s uncut, ultimate and a fan-cut? Which do you recommend? And please share your thoughts on the sequel!! Oh wow, I only know about the TV cut and the uncut version. Youtube uploaders are making me exceedingly confused. So what’s the ultimate and fancut versions and how are they different? The version you watched is the cut version as shown on TV. They edited the story because China banned time traveling. If you want to watch the version where Zhang Xiao remembers that she time traveled back, you have to search for the uncut version on youtube. I’ve been watching the FULL uncut version, ep 1 starting with Emperor Yong Zheng ordering his ring and Ruoxi’s hairpin to be buried in Northwest China. That is the legit version that makes more sense. Avoid the “TV-series” version where Zhang Xiao watched BBJX DVDs (or the series on TV) and fell in love with 4th Prince there. It really makes no sense at all. Currently Ep 1-4 are subbed. Search for mJ01991 user (usually her/his video starts with “Scarlet Heart 2.Bu Bu Jing Qing. E0x.Full version.English subtitles”.